Consumers' fascination with food has made The Food Network must-see TV for many an amateur chef. But while viewers may learn how to prepare a gourmet meal, they aren't going to learn much about avoiding E. coli and other foodborne illnesses. At least that's the conclusion of a study by researchers at the University of Massachusetts Amherst. Though they rarely burst into the headlines, food-related illnesses occur every day. The Centers for Disease Control and Prevention estimates there are 48 million cases each year, resulting in as many as 3,000 deaths. The U-Mass researchers say the popularity of cooking shows on TV provides a perfect opportunity to educate consumers on basic food safety, yet they say their study found little evidence of it. The researchers developed a survey with 19 questions, modeled after the Massachusetts Food Establishment Report. It looked at hygienic food-handling, how gloves and utensils are used, protection from contamination, and time and temperature controls. They also listened for mentions of food safety and proper practices. Researchers viewed 10 popular cooking shows – two to six episodes each – for a total of 39 episodes. Lead author Nancy Cohen said the survey found the majority of practices observed on the shows were out of compliance or conformance with recommendations in at least 70% of episodes. Food safety was mentioned in only three episodes. The high-profile foodborne illness outbreaks that make the news tend to occur at the manufacturing level or in restaurants, such as the recent E. coli outbreak at several Chipotle Mexican Grill restaurants. 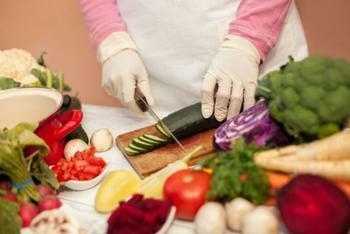 But the authors say many of the unreported illnesses occur when consumers prepare food at home. Until that happens, consumers should educate themselves on ways to properly handle and cook food to prevent illnesses. For example, the U.S. Food Safety and Inspection Service (FSIS) urges consumers to always refrigerate perishable food within two hours. You'll find other helpful FSIS food safety tips here.